TLJ Daily E-Mail Alert No. 2,269, July 25, 2011. Monday, July 25, 2011, Alert No. 2,269. 7/22. 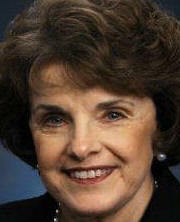 Sen. Diane Feinstein (D-CA) introduced S 1408 [LOC | WW | TLJ], the "Data Breach Notification Act of 2011". In the 111th Congress, she introduced S 139 [LOC | WW], the "Data Breach Notification Act", on January 6, 2009. The Senate Judiciary Committee (SJC) approved it on November 5, 2009. However, the full Senate did not pass it. The companion bill in the House was HR 6236 [LOC | WW], also titled the "Data Breach Notification Act". Rep. Adam Schiff (D-CA) introduced that bill on September 28, 2010. It was referred to several committees, none of which took action on it. Sen. Feinstein (at right) stated in the Senate on July 22 that "This bill would require that consumers be notified when their sensitive personally identifiable information has been exposed in a data breach and also that law enforcement receive notice of major breaches of data security." See, Congressional Record, July 22, 2011, at Pages S4846-7. Citing recent breaches at Epsilon and Citibank, she said that "It is long past time for Congress to pass a national breach notification standard to ensure that when consumers' information is at risk, they know it and can take the necessary steps to protect themselves." Sen. Feinstein also addressed preemption. She said that "under the current legal framework, businesses must comply with 46 different State laws to determine what kind of notice is necessary when a breach occurs. As long as it is not watered down, one Federal standard makes much more sense than 46 different State laws." This bill provides that "Any agency, or business entity engaged in interstate commerce, that uses, accesses, transmits, stores, disposes of or collects sensitive personally identifiable information shall, following the discovery of a security breach of such information notify any resident of the United States whose sensitive personally identifiable information has been, or is reasonably believed to have been, accessed, or acquired." It was referred to the Senate Judiciary Committee (SJC). Sen. Feinstein is a senior member. 7/20. Rep. Tim Bishop (D-NY) introduced HR 2598 [LOC | WW], the "STEM Master Teacher Corps Act", a bill to establish and authorize appropriations for a Science, Technology, Engineering, and Math (STEM) Master Teacher Corps program. It was referred to the House Education and Workforce Committee. This bill starts by reciting lofty goals, such as increasing the quality of STEM education in secondary schools -- particularly in schools located in high poverty areas -- and sending more students to college to study STEM fields. The bill authorizes appropriations for grants to pursue these goals. However, the bill's stated dedication to STEM education is contradicted by its failure to include meaningful requirements for eligible STEM teachers. The bill makes special education and English language teachers eligible. The bill imposes no requirement that any funded teachers have a degree from a four year college with a major or minor in any STEM field. This is the companion bill to S 758 [LOC | WW], the "STEM Master Teacher Corps Act of 2011", introduced on April 7, 2011, by Sen. Al Franken (D-MN), Sen. Joe Lieberman (D-CT), and Sen. Jeanne Shaheen (D-NH). See, story titled "Senators Introduce Bill to Provide Additional Compensation to STEM Teachers" in TLJ Daily E-Mail Alert No. 2,223, April 19, 2011. 7/22. On July 11, 2011, President Obama signed Executive Order No. 13579, titled "Regulation and Independent Regulatory Agencies". It states that "Within 120 days of the date of this order, each independent regulatory agency should develop and release to the public a plan ... under which the agency will periodically review its existing significant regulations to determine whether any such regulations should be modified, streamlined, expanded, or repealed so as to make the agency's regulatory program more effective or less burdensome in achieving the regulatory objectives." Independent agencies, such as the Federal Communications Commission (FCC) and the Federal Trade Commission (FTC), are independent of Presidential control. President Obama can ask for something, but not direct them to do anything. On July 22, 2011, Cass Sunstein, Administrator of the Office of Management and Budget's (OMB) Office of Information and Regulatory Affairs, released a memorandum for the heads of independent regulatory agencies. It states that it provides "guidance" for independent agencies on Executive Order No. 13579. Sunstein concedes, "nothing said here is meant to be binding". 7/19. The White House news office issued a release regarding reform of the U.S. export regulation regime. Also, the Department of Commerce (DOC) published proposed rules changes. This most recent development involves moving items from the USML to the CCL. The executive branch is in the process of revising its outdated and burdensome regulatory regimes. There are two. Although, the goal is to end up with one. The Department of State's (DOS) Directorate of Defense Trade Controls (DDTC) administers the International Traffic in Arms Regulations (ITAR) which controls the export of items on the U.S. Munitions List (USML). This list includes bombs, missiles, naval vessels, chemical agents, and other things that can be used to kill people and destroy things. The Department of Commerce's (DOC) Bureau of Industry and Security (BIS) administers the Commerce Control List (CCL) among other things. The DOC/BIS regulates dual use items, including things such as software, computers, and encryption products that may also have military uses. This is regulatory regime that is of particular importance to information and communications technologies companies. This release addresses the need for reform, reviews recent developments, and describes the remarks delivered by President Obama's Chief of Staff, Richard Daley, at a July 19 event. The release describes Daley's remarks regarding moving items from the USML to the CCL list, under a subheading of "Commerce Munitions List". The release states that "militarily less significant parts and components" will be moved. It states that "These changes will strengthen U.S. national security by allowing the export control system to focus on controlling the most critical technologies and by enhancing the competitiveness of key sectors." The DOC's BIS published a notice in the Federal Register on July 15, 2011, that announces, describes, recites, and sets the comment deadline for, the proposed rules changes that implement this change. The deadline to submit comments is September 13, 2011. See, Federal Register, Vol. 76, No. 136, Friday, July 15, 2011, at Pages 41958-41985. Frank Vargo of the National Association of Manufacturers (NAM) stated in a release that "Manufacturers urge a continued shift away from the transaction-by-transaction licensing system that is both costly and time-consuming and dampens our ability to export." He added that "Manufacturers have been calling for sweeping changes that will enhance our national security and contribute to the goal of doubling exports in five years. We look forward to working with the Administration and Congress to swiftly implement additional changes that will enhance interoperability with our allies, boost economic growth and help create manufacturing jobs." For more on this topic, see story titled "Obama Addresses Export Control Reform Process" in TLJ Daily E-Mail Alert No. 2,185, December 21, 2011. 7/25. The Technology Policy Institute (TPI) disclosed more speakers for its annual Aspen Forum, to be held on August 21-23, 2011, in Aspen, Colorado. The speakers will include Sen. Mark Udall (D-CO), Federal Communications Commission (FCC) Commissioners Robert McDowell and Mignon Clyburn, Federal Trade Commission (FTC) Commissioner Thomas Rosch. The speakers will also include Mark Berejka (Department of Commerce), Chris Painter (Department of State), and Kevin Gronberg (House Homeland Security Committee staff), Paul de Sa (FCC), and Daniel Weitzner (EOP's Office of Science and Technology Policy). The list of speakers also includes several economists, and numerous persons from the public policy, legal or government relations offices of leading information and communications technology companies. The event will be held at the St. Regis Aspen Resort. 7/22. The Federal Communications Commission (FCC) released an order [6 pages in PDF] that adopts and ratifies a settlement agreement (which is attached to the order) between the FCC and Spectrum IVDS, LLC, which filed a petition for review of a final order of the FCC (that it had defaulted in making payment to the FCC) with the U.S. Court of Appeals (DCCir). FCC Commissioner Michael Copps, quoting Shakespeare, wrote that "all is well that ends well". He added that "Today we approve a settlement with Spectrum IVDS that will allow it to keep its license if it pays its remaining balance and can show that it will meet the Commission’s requirements for license renewal." The FCC adopted this order on July 21, 2011, and released it on July 22, 2011. It is FCC 11-115. 7/21. The American Association of Publisher (AAP) issued a release on statistical trends in books sales, including e-books. It states that total e-book sales in the first five months of 2011 totaled $389.7 Million, up from $149.8 Million in the first five months of 2010. 7/19. The Discovery Institute (DI) published a short piece titled "Why Not the PROTECT IP Act?". The author is the DI's Hance Haney. He writes that "the PROTECT IP Act is not a nefarious piece of special interest legislation. The unanimous vote in the Senate Judiciary Committee last year reflects the fact that better enforcement of intellectual property rights is in the national interest, particularly during a period of high unemployment. Ultimately, the PROTECT IP Act is about protecting jobs and private investors. Objections to the bill, including the possibility of collateral harm to "innocent" websites and catastrophe if the Internet's highly centralized domain name system unravels, seem a bit overblown." See, S 968 [LOC | WW], the "Preventing Real Online Threats to Economic Creativity and Theft of Intellectual Property Act of 2011", or "PROTECT IP Act". The House will meet at 10:00 AM for morning hour, and at 12:00 NOON for legislative business. Votes may begin as early as 1:00 PM. The agenda includes consideration under suspension of the rules of S 1103 [LOC | WW], a bill to extend the term of Federal Bureau of Investigation (FBI) Director Robert Mueller by two years. See, Rep. Cantor's schedule. The Senate will meet at 2:00 PM. It will consider judicial nominations. TIME? Vice President Joe Biden, Secretary of Commerce Gary Locke (and Ambassador to PRC nominee), U.S. Trade Representative Ron Kirk, and others will hold a closed meeting regarding intellectual property. See, OUSTR schedule for week of July 25. Location? 11:15 AM. Day one of a two day meeting of the House Judiciary Committee (HJC) to mark up bills. The first of four items on the agenda is HR 1981 [LOC | WW], the "Protecting Children From Internet Pornographers Act of 2011", a bill to mandate data retention. See, stories titled "House Crime Subcommittee Holds Hearing on Data Retention Bill", "Summary of HR 1981, Data Retention Bill", and "Summary of Existing Data Retention Mandates" in TLJ Daily E-Mail Alert No. 2,257, July 13, 2011. The fourth item is HR 83 [LOC | WW], the "Bullying Prevention and Intervention Act of 2011". See, story titled "House Judiciary Committee to Mark Up Data Retention and Bullying Bills" in TLJ Daily E-Mail Alert No. 2,267, July 23, 2011. See, notice. Location: Room 2141, Rayburn Building. 10:00 AM. Day one of a two day meeting of the House Judiciary Committee (HJC) to mark up bills. The first of four items on the agenda is HR 1981 [LOC | WW], the "Protecting Children From Internet Pornographers Act of 2011", a bill to mandate data retention. See, stories titled "House Crime Subcommittee Holds Hearing on Data Retention Bill", "Summary of HR 1981, Data Retention Bill", and "Summary of Existing Data Retention Mandates" in TLJ Daily E-Mail Alert No. 2,257, July 13, 2011. The fourth item is HR 83 [LOC | WW], the "Bullying Prevention and Intervention Act of 2011". See, story titled "House Judiciary Committee to Mark Up Data Retention and Bullying Bills" in TLJ Daily E-Mail Alert No. 2,267, July 23, 2011. See, notice. Location: Room 2141, Rayburn Building.